Transformers War for Cybertron HD Video Review Xbox 360 – Robots with Surprise! A devastating war is raging for absolute control of the planet Cybertron, home to the heroic Autobots and their arch enemy the evil Decepticons. Transforming mechanical life forms in a desperate struggle to conquer or save this once peaceful world and you will bear witness to the epic origins of Autobot leader Optimus Prime and the maniacal Decepticon leader Megatron, before they embark to our own Earth. Transformers War for Cybertron lovingly grabs the very best elements of the original cartoon generation and the more modern up-to-date atmospherics of the latest Micheal Bay movie blockbusters. All your favourite Transformers will make an appearance including Starscream, Ironhide, Bumblebee, Ratchet, Soundwave and even Omega Supreme, all slightly redesigned. The voice acting as you might expect is quite cheesy at times with the inevitable dialogue that creates an uncomfortable sensation within your bones, however Optimus Prime features the wonderful vocal talents, by the one and only Peter Cullen, so fans will certainly recognise the resonating impact of this classic leader. After watching an impressive introduction video, you hop over to the main menu showing Cybertron in all its glory. Here you select the campaign mode, which begins with Megatron attempting to unleash the power known as dark energon, within the very core of Cybertron itself. This powerful and very dangerous form of energy has the potential to destroy everything the Autobots hold dear and luckily for you, you will be the one who controls both sides of the war. The engaging plot fills in some of the back story of how many of the Transformers first met and how their roles within the entire conflict were forged. The fairly lengthy chapters are split into two sections, starting with five controlling the Decepticons and a further five with the Autobots. Each individual chapter features a choice of three Transformers. You can quite happily play on your own with two A.I. accomplices, although the A.I. isn’t exactly the brightest. There are times when enemies run straight past you and your so called helpers have a tendency to get in your way, but at least they have infinite health, so no need to put yourself at risk, darting over every 30 seconds to revive them. A three player co-operative mode is also available with the option to invite your online friends. Each Transformer features two modes, which you admire from a third-person perspective. Fighting as a robot offers agility, which is perfect for when you are avoiding those pesky attacks. The vehicle mode will give you speed and very powerful weapons, although targeting is far more difficult. One of the nice features of the game is that both the robot and vehicle modes offer different weaponry, so you will find yourself switching fairly often. As your skills improve, mastering the fine art of what mode works best in your current circumstances is surprisingly easy. Transforming is achieved by pressing the left analog stick and although this can be triggered by accident on occasion, it is a handy method when you need to be moving constantly and dodging bullets and then suddenly transform on request to escape a swift death. Alternatively triggering the right analog stick will unveil an axe or similar weapon, ideal for close range combat. Watching your health and ammo levels is absolutely crucial. If they begin to run low, you will need to locate and smash crates that are carefully placed around the battle, which are in fairly generous supply. Your fellow team-mates can also give you a health re-charge if they happen to notice your ailments. Weapons are also collectable, including huge stonking ones you can literally transform into and if you wish, detach to avoid enemy fire. That’s not all though, as part of your ensemble are the special attacks, which are unleashed with the ‘RB’ button. Spin like a crazy bot, raise a shielded barrier or release a devastating pulse, however which attack you feature depends on the transformer you are currently using. There is no cover system, but as you are in the middle of a war zone, finding debris isn’t exactly a challenge. Online Multiplayer consists of a selection of familiar game types, including the customary Deathmatch and Team deathmatch, plus others that include carrying a bomb into enemy territory and so on. Here you can also create your own Transformer, well to a point at least. Selecting different abilities you unlock by playing online, weaponry, customising the two colours that are covered over your instrument of destruction and a few other little niceties. There are also four classes ranging from a simple soldier right up to a leader and this offers some incentive to continue levelling up all of their individual statistics. Another mode available is ‘Escalation’, which is wave after wave of enemy A.I. that come crashing down on you and a few friends, until you are all vanquished or you somehow manage to reach the end. You can also revive fallen comrades, but be quick as the time will soon run out. Transformers War for Cybertron uses the Unreal 3 engine and by golly it certainly shows. There are times when your jaw will literally drop at the on-screen wonderment and transforming animations. With a well known shared heritage, there are certainly times when you for a moment feel like you are instead enjoying Gears of War. The same dark surroundings, lack of colour and texture loading are indeed prominant, but if you are going to compare graphics with any title, hey why not be one of the greatest Xbox 360 titles of all time. The sound is equally impressive, with many of the auditory cues copied over from the latest films and of course the more faithful transforming samples. I don’t mind admitting to everyone that I am a Transformers nut and although Transformers War for Cybertron may not be the finest example of gaming excellence, it does achieve one very important thing. You actually enjoy transforming and kicking serious metal backside from start to finish. It isn’t a faultless experience and there are certainly issues with the sometimes questionable A.I., yet you can forgive many of the failings for what it offers in return. If you are a fan of either the original cartoon series or the latest cinema blockbusters, this title will be sure to delve straight into your passion zones, tickling them with ease. It is a wonderful nostalgic trip harking back to the 1980’s, while also strapping on the modern sound effects and atmospherics we are used to today. Can you really ignore this chance to take control of Optimus Prime in this amazing backdrop of Cybertron itself? No I didn’t think so. 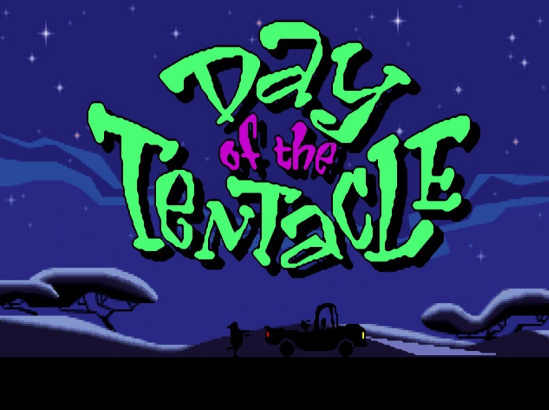 Next → Day of the Tentacle – When an Evil Purple Tentacle Tries to Take Over the World!